Sassy is a slightly dusty purple creme which doubles as a regular and a stamping polish. The formula was really easy to work with and was opaque at one coat. However I did two coats plus top coat (since that's the norm for me). Sweet is another stamping/regular polish. It's a cool-toned Barbie Doll pink with subtle silver shimmer. It's formula is thicker so I got more ridges in it when I applied it but top coat smoothed those away. The shimmer isn't very apparent except close up but you'll see below that it's more clear when it's stamped. This is two coats plus top coat. 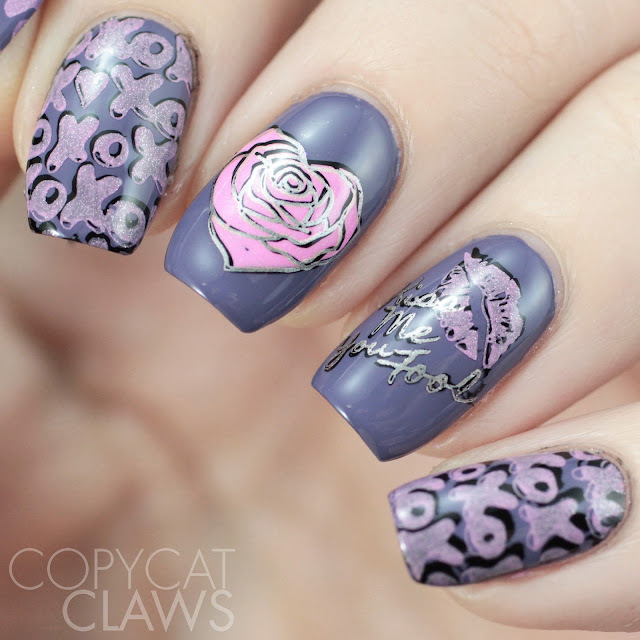 M025 is a really unique twist on a typical Valentine's Day stamping plate. 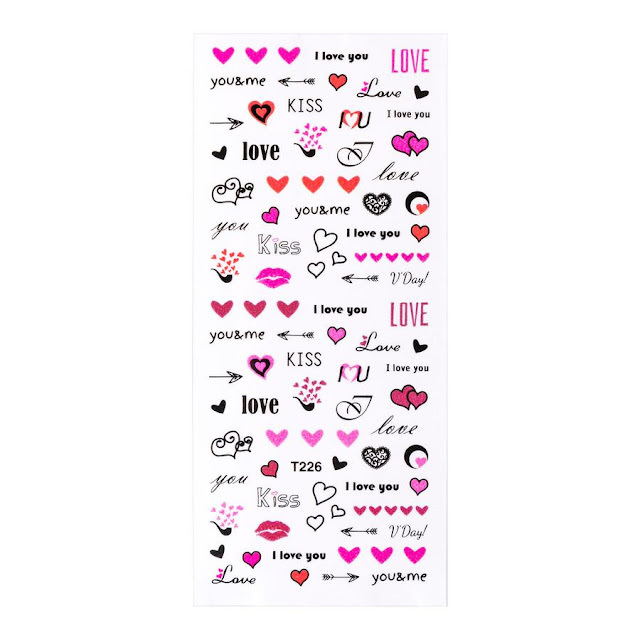 The left hand half of it is pretty standard with cute love-filled images. But it's the right side that stood out to me. That's the one for us single folk so that's the one I started with. 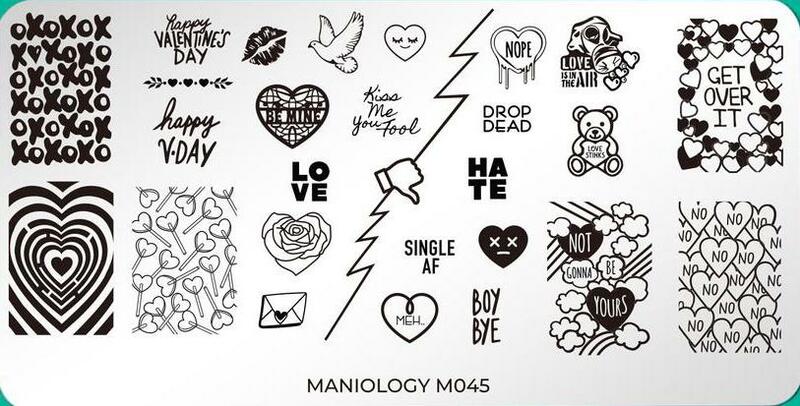 If I don't use that "Single AF" image on my nails on the 14th, I've failed myself! 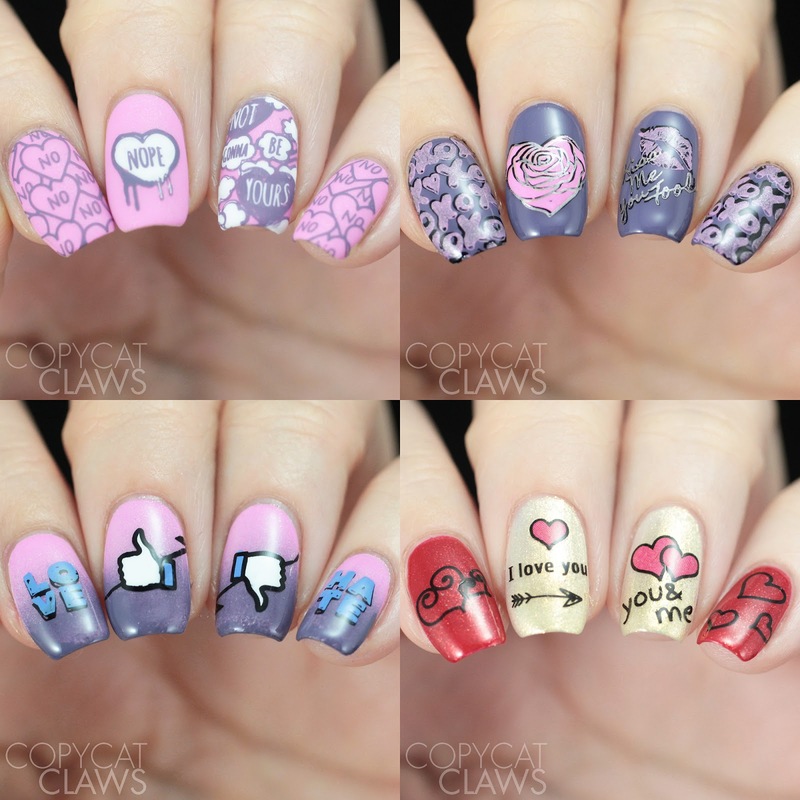 For these I used Sweet as my base and stamped with Sassy. 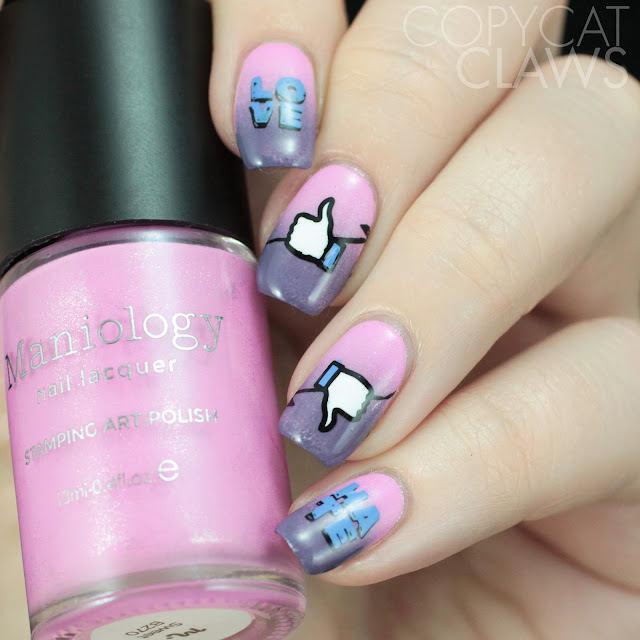 I really focused on these two polishes for this post so I hope you like pink and purple! For the middle two images I did reverse stamping (filling the images in with a white creme) and finished with OPI matte top coat. 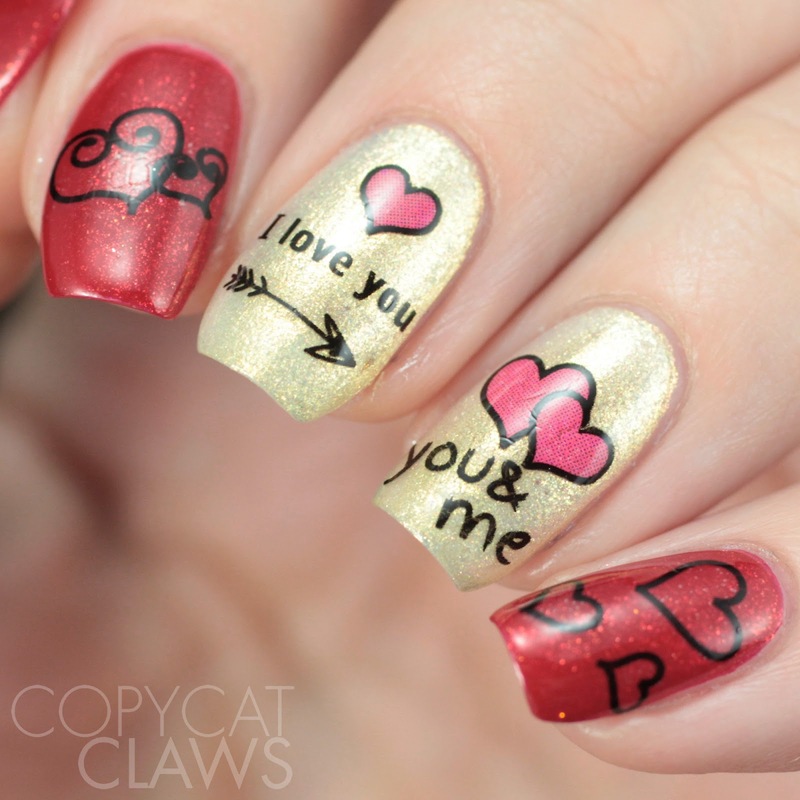 From afar these would look like a typical V-Day mani but close up? Nope! To use the more love-y half of the plate, I switched roles and used Sassy as the base. For the majority of the stamping I double stamped with Sweet over Mundo de Unas Black. It's not the most opaque stamping polish over a dark base but the shimmer is more visible. 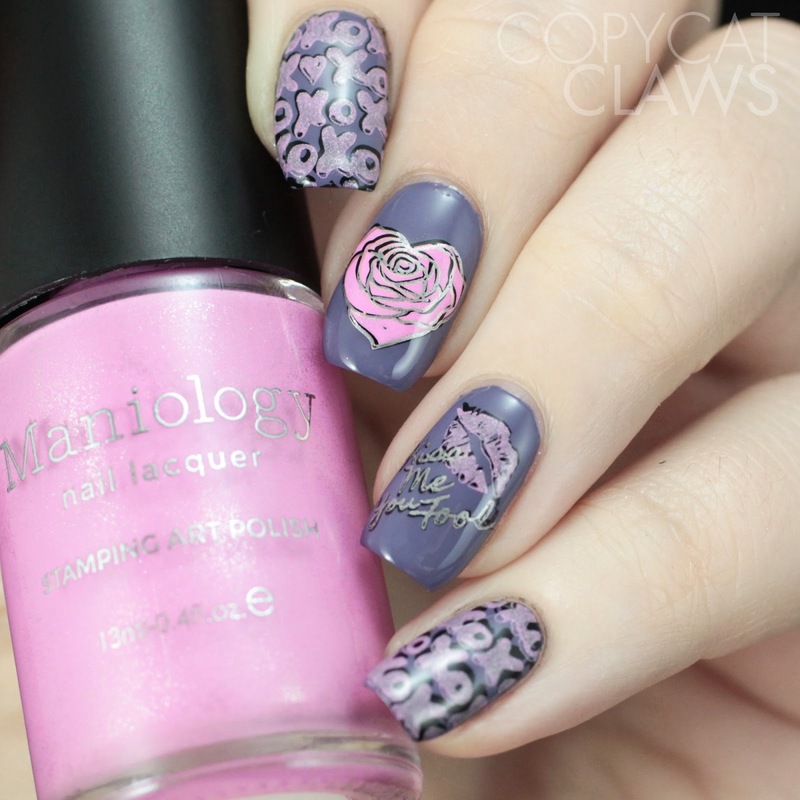 But it was super opaque for the reverse stamping heart-shaped rose. I also double stamped it (and the "Kiss Me Your Fool") with December's Snowdrift polish. To finish I used Glisten & Glow top coat. For a third mani, I combined both polishes (in a gradient over white) and both sides of the plate. This one isn't Valentine's Day-related at all. I just wanted to say that love is good and hate is bad. To stamp I used Mundo de Unas Black and Holland Blue and finished with Glisten & Glow top coat. The last part of the bundle is this sheet of rub on decals. If you haven't used these before, they're essentially like rub on stickers I had when I was a little kid. 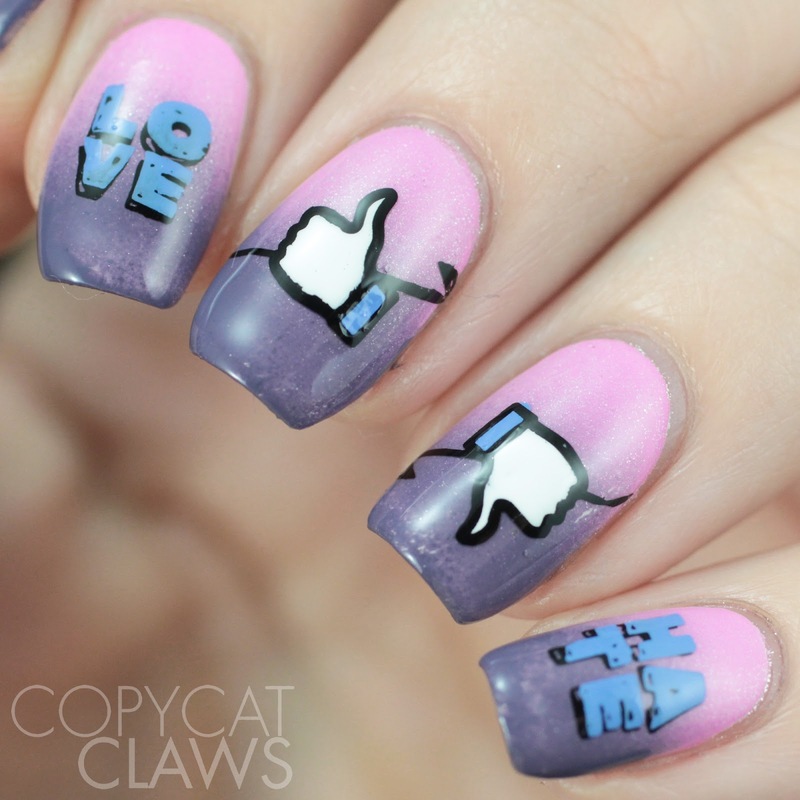 Just cut the sheet around the pieces you want and literally rub them onto your nails. I personally use a silicone tool (the same one I use for burnishing in powders). But you really have to make sure your nail polish is dry since you'll be applying pressure to your base! And a pair of pointy tweezers is handy too. 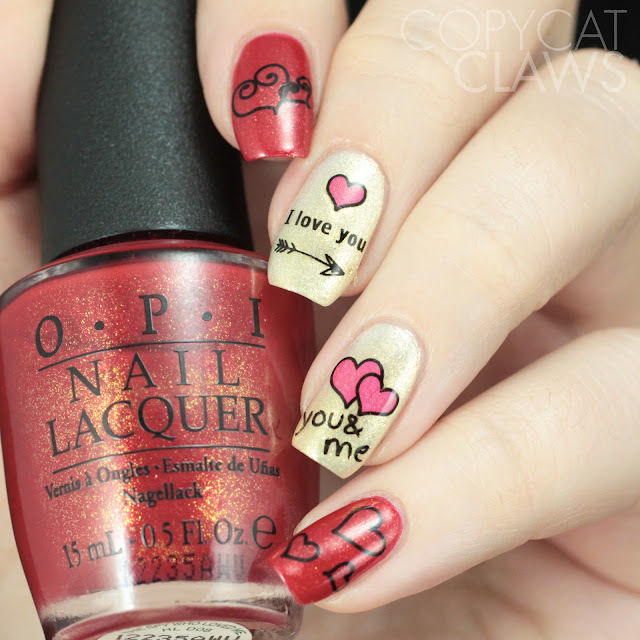 For this mani I used a couple of older OPI's, The Spy Who Loved Me and Ski Slope Sweetie. I have found in the past that the colored decals don't show up great over darker colors so keep that in mind if you're trying them out for the first time as well. Overall, I think this bundle is wonderful but my favourite part is definitely the stamping plate. 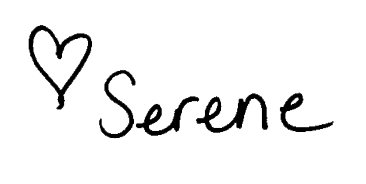 The bundle certainly saves you some money but while I was writing this I realized each component could be purchased separately if you don't want it all so I've linked each single product. AND they're all currently on sale in the "Galentine's Shop". Between that and using the code COPY10 (which saves an additional 10%), this is definitely the time to treat yourself!